Ryan M. Clancy, DMD, MAGD, LVIF first joined Cosmetic & Esthetic Dentistry in 2004, following his honorable discharge from the United States Army. He became a partner in 2010, and finally bought the practice in 2013. Since then, he has worked tirelessly to create a warm, welcoming practice for patients in and around the Boston area. If you are in need of general or cosmetic dentistry, please do not hesitate to give us a call at 781-396-8558 to schedule your appointment. We are pleased to serve patients in Medford, Winchester, Somerville, Cambridge, and Boston. Dr. Clancy believes in cleanliness, environmental responsibility, and giving back to the community. As such, his practice adheres to the highest standards of sterilization, and he actively adopts environmentally friendly methods, such as keeping electronic records and always recycling where possible. In addition, Dr. Clancy provides educational services to children, teaching them about the importance of oral hygiene. He also donates to the Boston Children's Hospital, and serves on the board of the Massachusetts Dental Society Political Action Committee. He is the former chair of the Massachusetts Dental Society New Dentist Committee, a position he held for five years. Providing caring and compassionate service to our patients is one of our fundamental values. Dr. Clancy and Dr. Martins treat each patient as a person, not a number, and take the time to listen to each patient's concerns, answer their questions, and formulate a custom treatment plan. We spend time with each patient in order to make sure we're giving you the most appropriate care and diagnosing you correctly. TV monitors at every treatment chair: Watch satellite TV or a DVD while undergoing treatment for a more enjoyable experience. NuCalm relaxation system: If you experience anxiety when visiting the dentist, we offer the NuCalm system to help you relax. Electronic appointment reminders: We offer appointment reminders by text or email to reduce paper waste and provide convenience. The most advanced dental technology: You can rest assured that all of our dental techniques and technology are cutting-edge, safe, and effective. We make sure to keep up with the times, and do not use outdated technology. Our dentists and staff are committed to continuing education and training in order to provide the most advanced dentistry to our patients. We attend safety and infection control seminars, as well as courses in the latest dentistry techniques. 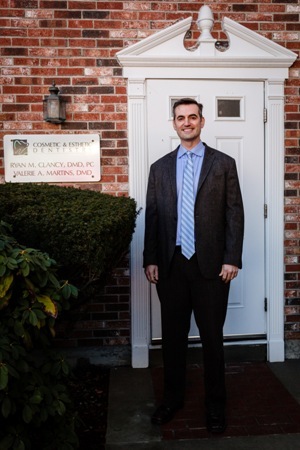 Dr. Clancy has deep roots in the Medford community. He and his family were born and raised in Medford, and he has three close relatives represented on the World War II memorial in Medford. After serving for 8 years in the U.S. Army himself, Dr. Clancy returned to his hometown, and has been providing dental health and education here since. We understand that serving a community means taking action both inside and outside of the office. 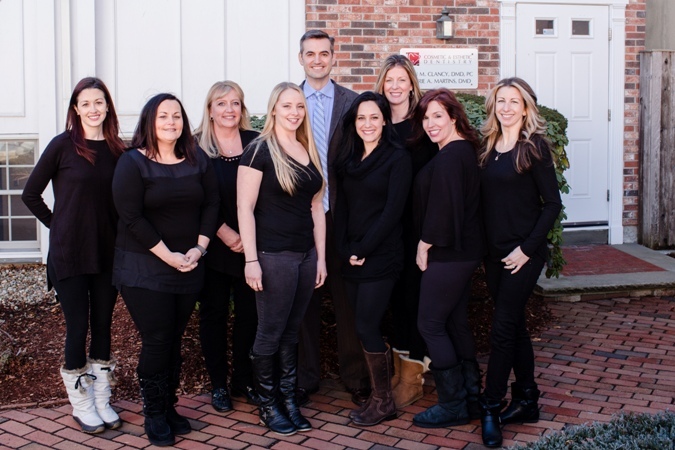 Our dental practice is active in the Medford Chamber of Commerce, where we remain involved in issues affecting the business climate of Middlesex County. We also provide financial support to organizations that hold special meaning to our staff. Dr. Clancy supports Boston Children's Hospital, and you can see our staff's selections in our newsletters. We always stay on top of advancements in dental techniques and equipment in order to benefit our patients through increased safety, comfort, and quality. Our state-of-the-art diagnostic tools help us to confidently diagnose dental issues, and our advanced dental software allows us to plan and create custom treatment packages to best address your unique dental needs. The combination of the latest technology along with the skill, experience, and compassion of our dentists and staff mean that you are getting the best possible treatment every time you visit us. If you are looking for a caring dentist who puts you and your needs first, look no further than Cosmetic & Esthetic Dentistry. Give us a call at 781-396-8558 to schedule your initial appointment. We look forward to seeing you. We serve patients in the Medford, Winchester, Somerville, Cambridge, and Boston areas of Massachusetts.